The Austrian Minister of Economics, Reinhold Mitterlehner wants to increase efficiency and reduce redundancies in economic subsidies. “We strongly support the decrease of the tax quota, which goes in line with an efficient reform of expenditures. 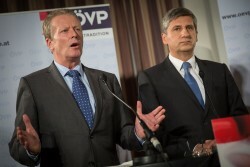 The problem is the expenditure side.”, Reinhold Mitterlehner says. For the Minister, there is no margin for new taxes anymore.